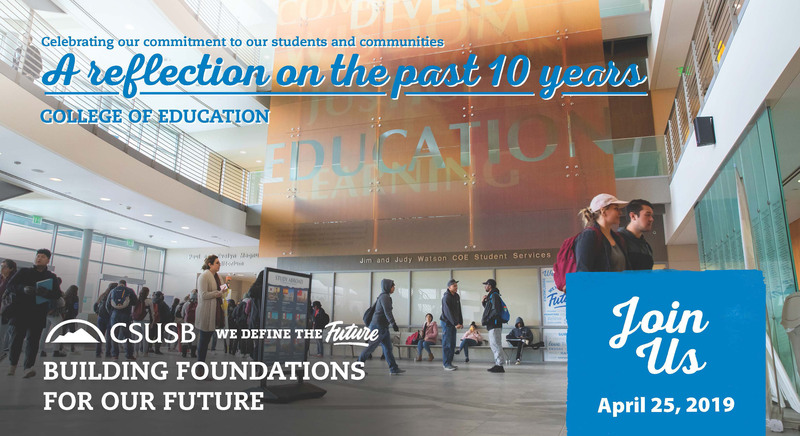 The College of Education at Cal State San Bernardino will host an open house on Thursday, April 25, to celebrate 10 years since it moved into its building on campus. The event is free and open to the public; RSVPs are requested by Monday, April 15. The College of Education at Cal State San Bernardino will host an open house on Thursday, April 25, to celebrate 10 years since it moved into its building on campus. The event, which is free and open to the public, will take place from 4:30-7:30 p.m. in the College of Education’s atrium. Hors d’oeuvres and refreshments will be provided. RSVPs are requested by Monday, April 15, and can be done online on the open house event page. Parking at CSUSB is $6. CSUSB’s College of Education at California State University, San Bernardino is home to an extensive teacher preparation program, including six different teaching credentials, 16 master’s programs and a doctoral program in educational leadership. Its faculty is committed to providing the best quality training for those seeking a professional career in education. Organized into four departments, the college’s students have options to pursue studies in the areas of teaching, special education, educational administration, guidance counseling, reading and language arts, school psychology, rehabilitation counseling, as well as programs in career and technical studies, instructional technology, teaching English to speakers of other languages, and correctional/alternative education. The College of Education is regionally accredited and has established a reputation for rigorous professional preparation and quality instruction. Its faculty remain passionate about providing an intensive classroom experience that will prepare its graduates for meaningful and successful careers in education. Visit the CSUSB College of Education website at coe.csusb.edu to learn more about its programs.